Using one large saucepan and a large bowl, separate the skins and pulp. Place the skins into the large bowl, and the pulp into the saucepan. Heat the grape pulp over medium heat. Stir the pulp and let it boil for about 10 minutes. Remove from the heat. Place a strainer on the bowl with the skins in. Push the pulp through to catch all the seeds. Discard the seeds. In a small bowl whisk together the sugar and clear jel. Add 1 cup of the grape skins/pulp into the sugar and clear jel and continue whisking. This will help to avoid lumps into the mixture. Pour the sugar mixture into the saucepan with the rest of the grape skins and pulp. Place over medium heat and give it a stir to incorporated the sugar mixture. Let the filling come up to a boil and stir often. As the mixture thickens, it will change from a pink, to light purple, and when it's ready it will be a deep purple. Boil for about 10 - 15 minutes until very thick and bubbly. Remove from the heat and prepare pie crust. 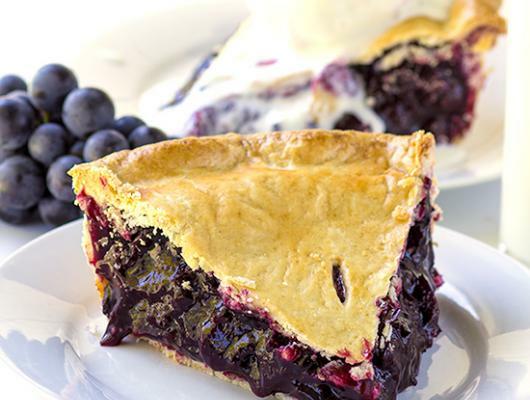 Add the grape pie filling into the prepared crust. Spread it out evenly. Let cool and place into the fridge overnight. Serve chilled. 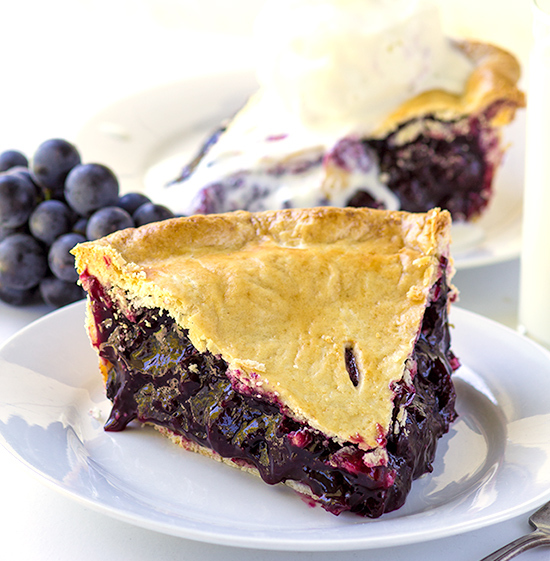 Concord Grape Pie - delicious grape pie filling baked inside a pie crust and topped with a scoop of vanilla ice cream!